20th Feb 2014 : - Kochi: The English translation of Parappurath’s classic novel ‘Ara Nazhika Neram’ was released at Avenue Centre, Panampilly Nagar. Translated by K. P. Joseph under the name ‘A Half Hour’s Time’, the book was published by Avanty Publications. 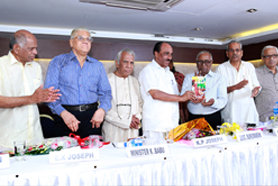 Minister K. Babu released the book by issuing it to Justice K. Sukumaran before a panel of people including Former Ambassador K. P. Fabian, Supreme Court Advocate E. X. Joseph and writers C. Radhakrishnan, K. L. Mohanavarma, and Francis J. Kalarickal. A bilingual writer by passion, K. P. Joseph also has around 15 published works to his name. He was the Former United Nations Food and Agriculture Consultant and GM Finance at the Cochin Shipyard. E X Joseph Supreme Court Lawyer and Social Activist, KL Mohanavarma, Novelist and author of ‘Ohari’ which was later made into a T.V. Serial and Editor of Veekhanam, Justice K Sukumaran, famous for his works on Human Rights and won Kerala Sahitya Academy Award for his work ‘Niyama Sameeksha’. C Radhakrishnan Ex-Editor, Madhyamam and writer. Now 84, he was born in the temple town of Aluva on March 5th 1930 in an orthodox Christian family and many of his books are derived from his personal experiences. An MA graduate from the University of Kerala he has worked as a Consultant FAO of the United Nations in Iraq and Rome . His writings embody a spirit of tolerance towards different ideas and beliefs and a genuine respect for all religions. He also worked for Cochin Shipyard and retired as Chief Manager Finance and Management Services . Ara Nazhika Neram (Half an Hour Only) is a Malayalam novel written by Parappurath most famous novels by the prolific author, it won the Kerala Sahitya Akademi Award and Sahitya Pravartaka Award.Set in the Central Travancore region in the 1960s, the story revolved round an Orthodox Christian family headed by Kunjenachan, a ninety-year-old atriarch who lives his life by The Book. The novel had a highly successful film adaptation with the same title in 1970. The film was directed by K. S. Sethumadhavan and featured Prem Nazir,Kottarakkara Sreedharan Nair, Sathyan, K. P.Ummer, Adoor Bhasi, Ragini, Sheela and Ambika Sukumaran.